Sir Charles Portal speaking, on his left Archibald McIndoe and Sir Alec Coryton. On his right an unnamed civilian. Captioned 'HQ1531' and on the reverse 'Lord Portal'. Archibald McIndoe and two airmen seated with Sir Alec Coryton standing giving a speech. Captioned 'HQ1522' and on the reverse 'McInoe [sic] Ross Tilley (RCAF)'. 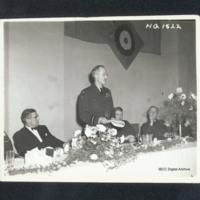 Sir Charles Portal, consultant plastic surgeon Archibald McIndoe, Air Chief Marshal Sir Alec Coryton, Wing Commander Albert Ross Tiller RCAF (plastic surgeon) seated on the top table. 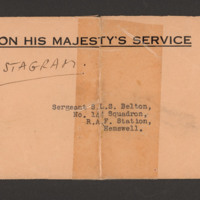 Captioned 'HQ1526' and on the reverse 'Portal'.